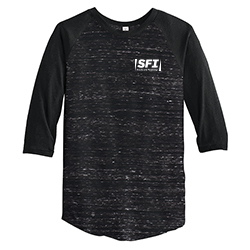 Men's 3/4 Sleeve Baseball T-Shirt. 4.13 oz, 50/38/12 poly/cotton/rayon. Classic fit. Contrast raglan sleeves. Slight shirttail hem.